To answer: Elvis had hazel eyes. Sometimes his eyes looked blue, turquoise, green and turquoise, greenish, and yes, brown. The eyes you see on the cover of this set are his eyes. I agree with previous reviewer, why are his eyes brown? He didn’t have brown eyes, he had blue the window to,his soul. Please fix it! 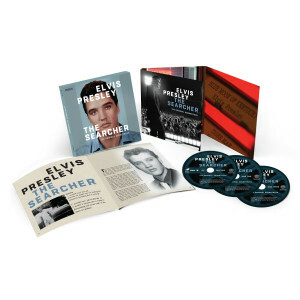 Why are Elvis' eyes colored BROWN on the front cover of this set? He had BLUE eyes.